The Johnston 3-pass boiler has large steam and water storage areas, high efficiencies, and the ability to meet wide load demands. The three pass design can be manufactured up to a 750 HP steam boiler. The 3-pass maximizes heat transfer while minimizing the use of refractory – no expensive door repairs. 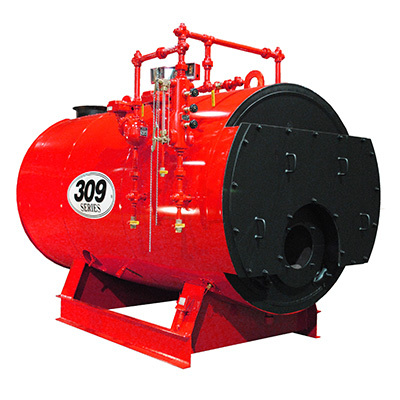 The 309 Series package consists of the pressure vessel, base assembly, and boiler trim. Burner and controls are provided by others. The 309 Series is specifically designed to match your burner with our boiler. Our sales team will provide you with a detailed proposal based on your specific design requirements.